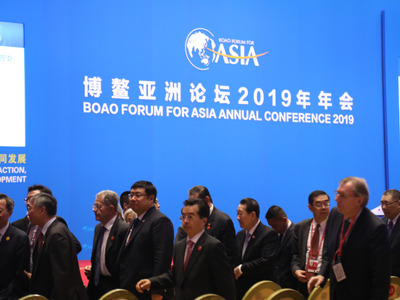 The country will fully adopt pre-entry national treatment and negative lists for overseas investment, Li said at the opening ceremony of the forum's annual conference in Hainan province. By the end of June, China will release the amended negative lists for foreign investment access, he said. "The negative lists will only be shortened... We will ensure fair competition and common development for Chinese and foreign companies with fair supervision," Li told more than 2,000 participants. The government has started formulating matching regulations and rules to support implementation of the Foreign Investment Law, adopted two weeks ago, Li said, adding that supporting regulations will take effect along with the law on January 1. The draft amendment to the patent law has been submitted to China's top legislators. It sharply increases compensation for infringement to a cost that violators will not be able to afford, he said. Forced technology transfers are prohibited and violators will receive harsh penalties, Li said. The complaint mechanism for foreign-invested companies will be perfected to improve exchanges and coordination between the government and investors, making it an effective way to protect the legal rights of foreign companies, he said. China will not resort to massive economic stimulus to boost growth, but will continue to open up and innovate to energize market players, Li said. The country will further open up its financial sector and accelerate the process to fully lower the market access threshold for foreign investments in banking, securities and insurance, the premier said. Service sectors, including medical care and education, will be opened up along with transportation, infrastructure and energy, he said. Li said China will further make it easier for foreign companies to set up a venture capital presence and will improve regulations on foreign investors' strategic investments in listed companies and their mergers with and acquisitions of domestic enterprises. Also, preferential policies for investments from Hong Kong, Macao and Taiwan will remain unchanged, and greater development opportunities will be offered for them, Li said. "It shows China's attitude of further opening-up, which is a higher-level and more concrete commitment of China," he said. Leif Johansson, chairman of global biopharmaceutical giant AstraZeneca, said Li's speech reflects the determination to create a more open, fair and transparent investment environment. "Such an optimized market as well as a positive and dynamic investment climate will inspire us to expand our footprint in China and promote more cooperation with domestic firms to realize mutual development," he said.